Sam Stedman, publisher of EcoParent magazine, is 'The Domestic Dad'. Part tech-junkie, part cloth diapering diva, all man, he tells it like it is. My mission: to spend as much time hiking with my little man - about 30 lbs. at the time of testing - as possible. But with so many SSCs (Soft Structured Carriers) on the market, how can one choose? I reviewed three of the top brands - with a focus on their ‘hikeability’ - and I’m afraid the findings won’t make it much easier for you to choose, as they all exceeded expectations. Remember: always hike with your toddler on your back, so you can see the ground! 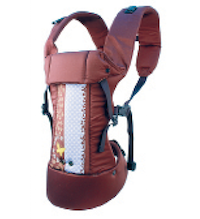 Want to win one of the three carriers reviewed? This carrier was a HUGE surprise. I mean, it’s the ‘Urban Chic’ model in the travel collection - it’s even advertised with a picture of a chic urban dad out shopping in the big city with a freshly squeezed urban chic drink in his hand. Let me tell you, it did not let me down hiking in the woods! 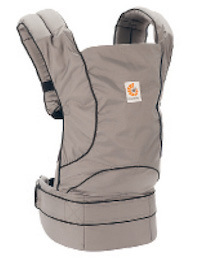 ERGO has brought babywearing to the urban chic jet-setter WITHOUT sacrificing even an ounce of performance. Adjustability: Very easily adjustable on the fly. I like to make regular minor adjustments as I go, and the ERGO made it easy-peasy. My Comfort: Fit this chic urban dad (yep - I look just like the guy in the ad) like a glove. Weight nicely distributed between shoulders and hips. His Comfort: Little guy didn’t complain once, and he looked comfy too! Positioning looked good. Green Factor: The best green profile of them all. 100% Recycled Polyester outer, 100% Organic Cotton Poplin inner. What’s not to love? This is a bullseye! 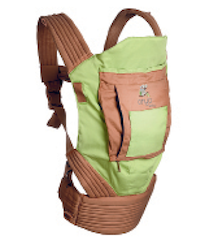 Extremely well structured, the ‘Gemini’ would be my choice for comfort if you’re planning LONG hikes in the woods. You won’t be complaining about sore shoulders an hour in. Adjustability: Not as easily adjustable as the other two. So, there was a bit more of a learning curve to find the ‘sweet spot’. But once I found it, it stayed sweet! In hindsight, it was good for me to NOT be able to make 1000 fiddly adjustments, allowing me to look around and enjoy the view! My Comfort: Felt super solid. Majority of weight distributed to hips, making my shoulders VERY happy. His Comfort: Less ‘bum pouch’ than the other two, making it harder to get the right positioning, as he was at the upper end of the Gemini’s weight rating. We would have been better off with BECO’s ‘Soleil’ model, rated to 45 lbs. Green Factor: Both the 'Gemini' and the 'Soleil' have organic cotton versions, though you might miss them on the website if you're not careful (On the Beco website click Shop > Organic and then click on the small swatches under "Other Items"). And the packaging is 100% recycled content, which made me smile. The ‘Cruiser’ demonstrated surprisingly good balance, and really great positioning for my little man. It’s minimal structure and smart design allows the child’s own weight to dictate posture, providing maximum comfort for your precious cargo. Adjustability: Very adjustable. Just one word of caution: with a 34” waist, I was getting near the end of the strap! At 36”, you may need one of their waist belt extenders. My Comfort: I love the feel of this carrier. Soft and supple, everything contours to the body. Only challenge was the waist strap, which is thinner than the other two. Had to work a bit to find just the right spot for it - trickier if you’re wearing a belt. His Comfort: I’d say the Onya provided the best positioning of the three. The knee to bum relationship (knees should never hang below the bum) was impeccable. Green Factor: No organic textiles employed, but they have made the effort to ensure ethical manufacturing practices in the Philippines.